Peel the pears but leave the stems attached. Pour the bottle of wine in the pressure cooker. Add the bay leaf, cloves, cinnamon, ginger and sugar. Mix well to dissolve. Add the pears into the Instant Pot. Close and lock the lid of the Instant Pot. Press [Pressure Cook] and then use the [+] or [ - ] button to set 9 minutes of pressure cooking time . Take out the pears carefully using tongs and picking up from their stems. Set the pears aside and put the pressure cooker on [Sauté], without the top, to reduce the cooking liquid to about half. 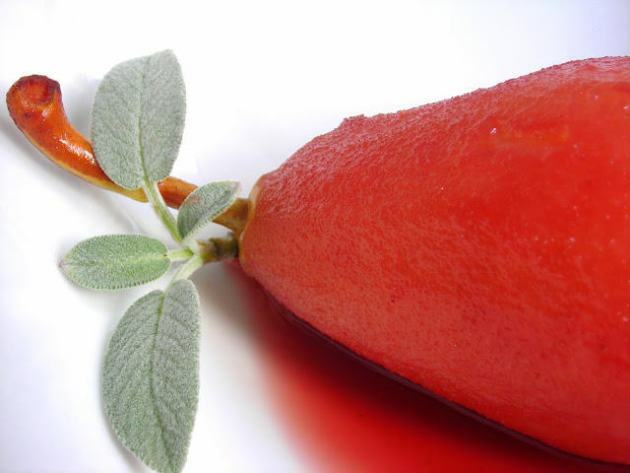 Filter and then drizzle spiced wine syrup on pears, decorate with herbs and serve room temperature or chilled. We like the Winexpert Selection Sangiovese or the Cellar Craft Sterling Barbera for this.